I don't think I've ever enjoyed the cold, especially when I'm in WDW. But, this was one instance where the cold was pretty awesome for a shot. 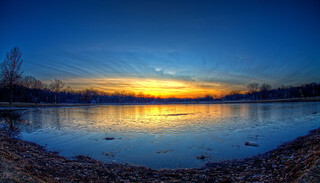 This little lake(trust me, it is little, the fisheye just makes it look epic) was half frozen, which led to increased reflections of the sunset, which made me a happy guy. Thanks for lookin', and have a great day! I can't stress how important it is to view this Large On Black! !